QATAR - 31 October 2018: Milipol Qatar 2018 held under the patronage of H.H the Emir of Qatar Sheikh Tamim bin Hamad Al-Thani concluded its 12th edition on October 31, 2018. The three-day show which was inaugurated by Prime Minister and Minister of Interior H.E. Sheikh Abdullah Bin Nasser Bin Khalifa Al-Thani, along with other dignitaries from different countries has attracted 8,487 visitors (+39% vs 2016). While the total value of deals that were declared during the 3 days of the exhibition reached 572.5 Million Qatari Riyals. The leading international event, dedicated to Homeland Security and Civil Defence in the Middle East region 2018, set the agenda for internal security and public safety with leading international specialists bringing new products & solutions, across a range of industries. This year the exhibition has confirmed 222 exhibitors from 24 countries. Defence specialists from Qatar, France, Turkey, Bulgaria, China, Denmark, Italy, Germany, Spain, Morocco, UK, and USA, as well as 7 new countries that include Greece, India, Latvia, Morocco, Russia, Slovenia and Switzerland brought in their innovations to Qatar in various fields such as public security, defence solutions and equipment, telecom security and technologies, firefighting, radiation detection, emergency equipment, law enforcement products, communications software, airports security systems and more. Organized by the Ministry of Interior (MoI) of the State of Qatar and the French-based Comexposium Security, Milipol Qatar 2018 included also five country pavilions – including UK, Germany, Italy, France and North America with 90 exhibitors from Qatar–with a 30% space bigger than in 2016. 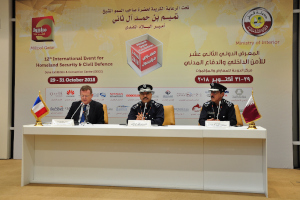 As part of its continuous evolution to provide the best experience for exhibitors, visitors, buyers and industry professionals, Milipol Qatar 2018 has incorporated the Civil Defence Exhibition and Conference.The collaboration of the two shows has resulted in the region’s leading Homeland Security and Civil Defence event, bringing together key global civil defence players, for a series of focused conference sessions and agenda-setting panel discussions on the latest and emerging civil defence trends and best practices. The addition of live demonstrations for the first time to Milipol Qatar, presented homeland defence pioneers from around the world the opportunity to display their technologies in a controlled environment, giving key decision makers, exhibitors, visitors and buyers the opportunity to witness new products and innovations in action. Founded in 1996, Milipol Qatar is a trade event dedicated to homeland security founded and organized by the Ministry of Interior of the State of Qatar and the French-based Comexposium Security. A biennial event, Milipol Qatar attracts to Doha the biggest companies in the public and industrial security sector in the world. These companies showcase the latest products and service innovations in the fields of security, safety, detection and prevention equipment and systems.